Enjoy a brief video demonstration then scroll down to view more details. 360e’s robust CRM manages your customers, vendors, contacts, and their relationships to all sales and job activity in your company. Our sales and customer management software is also flexible and understands the many nuances in the contracting industry like multiple jobsite and billing addresses, third party job contacts, outsourcing, and the need to keep statistics handy when looking at customers records. 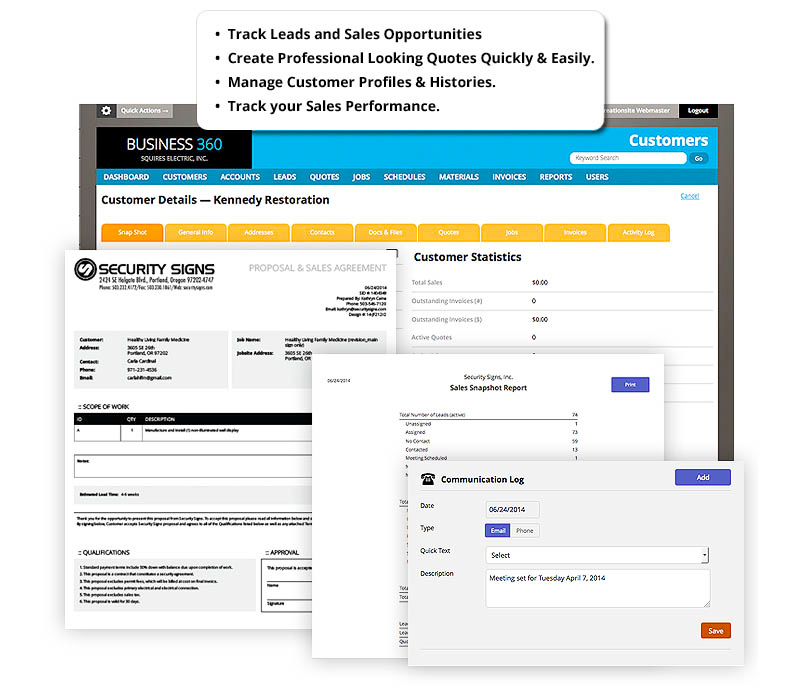 From tracking leads and generating professional quotes to an easy one-click order conversion process, 360e field management software allows you to manage your sales cycles with simplicity while covering the important details that facilitate high closing ratios. No more re-entering data from one place to another! 360e’s job management and tracking software sets up your jobs quickly and then tracks work in progress while managing important job requirements like permits, code upgrades, and more. Job dashboards and real-time cost tracking, along with fully integrated communication and document systems, allow you to manage work as it is happening and to keep job details organized and accessible. When the job changes (as it so often does), 360e is the contractor software you need to track change orders and keep everyone informed (in the office and in the field) so that work can keep moving. 360e’s scheduling system is designed for flexibility and keeps you in control of your schedule, especially when things change. 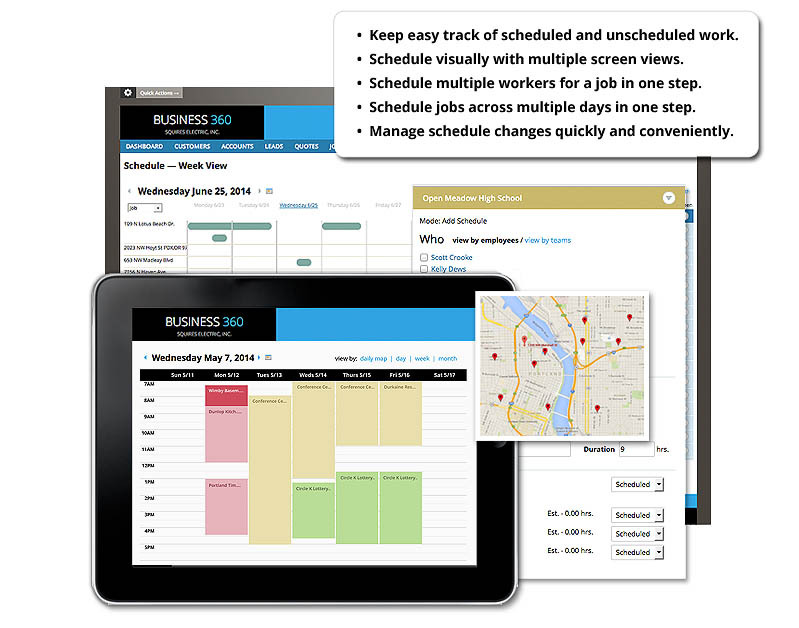 Visual scheduling with multiple screen views allows you to browse displays by day/week/month and by employee or job so you assign work with maximum efficiency. To eliminate guesswork, 360e field management software lets you see labor estimates for each job while you are scheduling. You can also schedule multiple workers for a job and schedule across multiple days in one step. Get your invoices out quickly and accurately with our exclusive billing software. First, 360e will notify you when it’s time to invoice with its built-in status alerts. Next, 360e will put all the information in front of you that you need to ensure accuracy. This includes tracked labor hours (at multiple pay rates), material costs, equipment use, and communication logs. 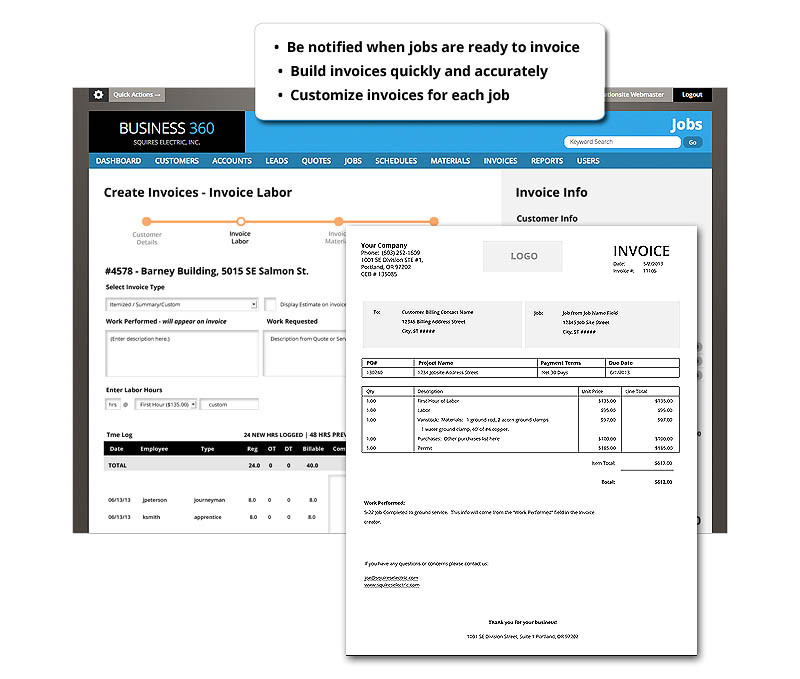 Build your invoices using suggested billing rates or modify them for each invoice. Want to show pricing breakdowns or just a summary, display the original estimate, or add additional notes? 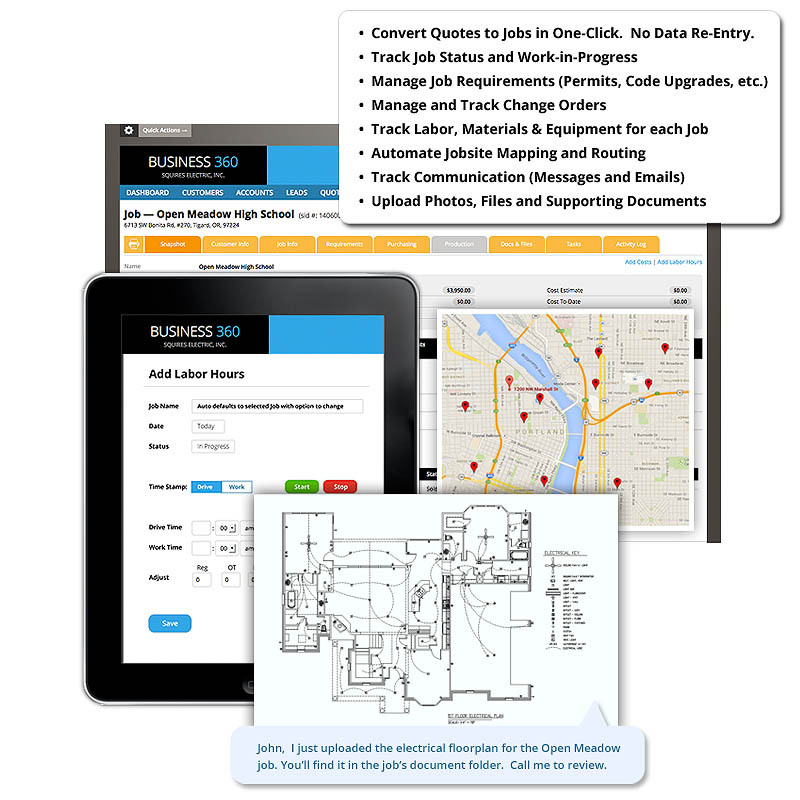 360e contractor software is especially useful for small businesses and contractors because it lets you customize your information to display every important detail as you like for each invoice. *360e integrates directly with Quickbooks and other accounting systems to make invoicing completely seamless. Get the metrics you need without having to sort through hundreds of pre-made templates. 360e’s reporting system simplifies reporting and delivers powerful metrics through an easy-to-use, intuitive interface. Measure your sales performanc and protect your best practice and profit margins with 360e reporting. Need a very specific report? No problem. 360e can be customized to deliver any type of report you need using any information that is in the system. 360e understands that sometimes you need to zoom in and look a the details and sometimes you need to see the big picture. From Quick Stat Lists to Dashboards and Snapshot screens, 360e lets you zoom in and out of your business to keep you in the driver’s seat. When leads haven’t been called, when permits haven’t been pulled, when jobs run over budget, 360e will tell you. It’s built-in alerting system will protect your best practice with alerts that post intuitively throughout the system. This powerful feature can also be customized to meet your speciic needs. 360e’s intuitive Document Management System allows you to upload and store documents, photos and other files within specific customer, quote and job folders. 360e also allows you to manage and track new versions and revisions to existing files. No more searching multiple hard drives for that lost email, 360e’s Communication Module executes and tracks all communication within specific quote and job folders, allowing you to keep everything in one place. Likewise, workers can stay connected to the main office in real-time through messaging, comments and email. 360e’s built-in Activity Log will let you know when things happen exactly when they happen. The Activity Log automatically tracks every action within the system against its respective Customer, Quote and Job. Whenever an action is created, All actions are time-stamped by date, time and user. 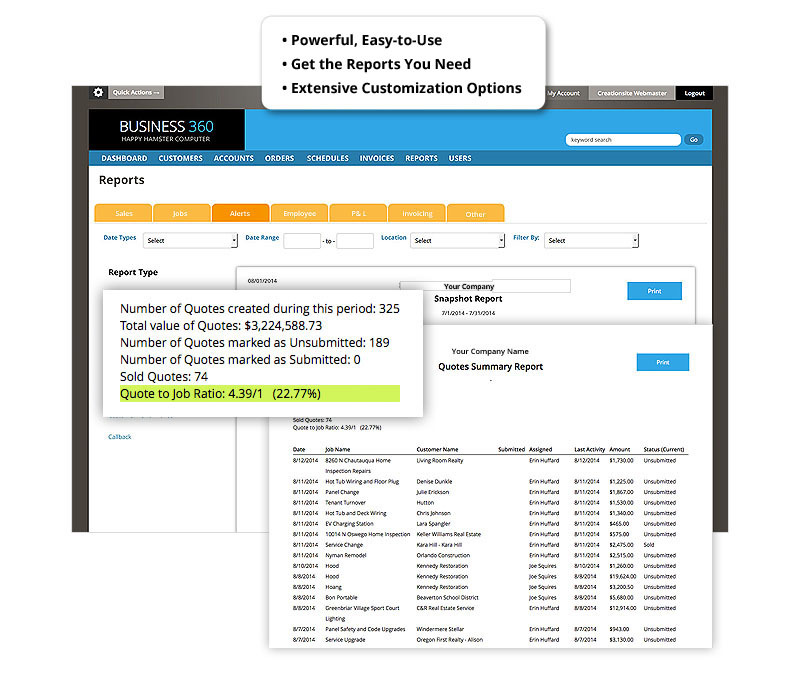 Need a specific report, Custom Alerts or an Estimating Tool? Call us at +1-800-725-9897 or contact Us online to see how 360e can dial-in the specific needs of your business.